As recycling coordinator at an Ivy League school for 20 years, I learned that no matter how bright a person is they need very strong signals when passing by a receptacle in order to use it wisely. Their rocket scientist reading brain is not engaged when strolling down a hallway. It is up to us to make it more than obvious what the bin is for. Here’s a few vital boxes to check as you launch your own rocket ship of a recycling program. 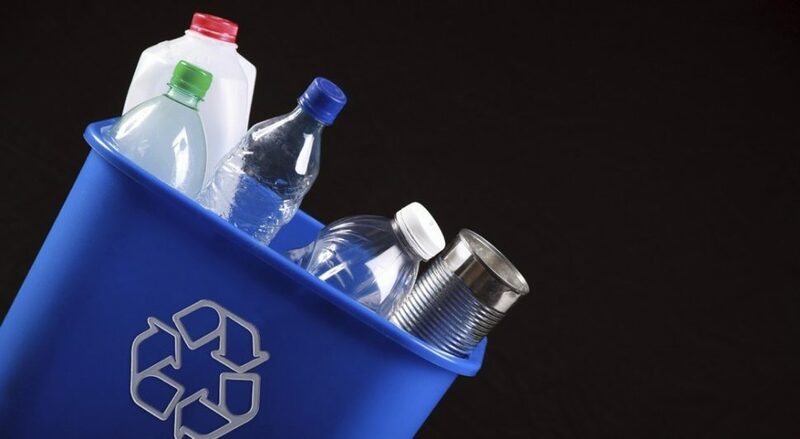 Make sure that you place your recycling bins immediately adjacent to the trash bins in your recycling program. Human nature is such that the average person will toss whatever they no longer want into the first receptacle they encounter however it may be labeled. By placing the trash and recycling together you ensure they have both choices at hand. You may have to fight to keep your bins adjacent since the logic is not obvious to everyone. I have seen well-intentioned administrators place bins in a large event room so there was a single bin every 10 feet alternating trash and recycling. This would likely lead to a high level of contamination. Trash would go into the recycling bins, cans and bottles would go into the trash, cats would fraternize with dogs…you get the picture. The paired trash and recycling bins must look similar enough to be considered “a pair” at first glance, but different enough so that the first glance cues the passerby to pay attention. Frequently, “similar but different” is achieved by having the bins be of very similar design but different in color. To the average passerby an open receptacle, no matter how well-labeled, is a trash bin. I have seen so many well-intentioned administrators throw up their hands in frustration, claiming recycling was impossible in their building or facility because people misused their lidless recycling bins. If you are frustrated with the contamination in your open-topped recycling bin put a lid on it….literally. Within reason, match the shape and size of the hole in the restrictive lid to the items to be placed within for example, a slot for paper and round hole for bottles. I have even seen silhouettes of rubber gloves and myself made cuts in a sneaker recycling bin that were the shape of sneakers. For single stream recycling a common hole shape is that of the planet Saturn. This combines both slots for paper and circle for cans and bottles. Diverse lists of recyclables may require larger openings, either square or round in shape. With either full-color images or recognizable silhouettes, mark the bins with pictures of what you want to place inside. Busy passersby see images more readily than they do words. Although last and least from my perspective, labeling bins with words describing what is to be discarded is still vital. Adjacency, color, style, lid hole shape and images should get the attention of passersby and likely do the job of informing them of what goes where. If they have any remaining indecision, however, your wording is the definitive answer. Ideally, have a bold and simple title in large letters e.g “MIXED RECYCLING.” This may be followed by a list, ideally in both words and images, of specific items. Including such a detailed list may prove a challenge so your words may best trimmed down to a brief overview e.g. “CANS/BOTTLES/PAPER”.